Women are the emotional ones. So we say. When we attend weddings, we expect the bride, bridesmaids, mother of the bride, mother of the groom, and all the women therein to cry their hearts out on the touching moments of the wedding or while they deliver their speeches for the couple. Above all, we expect the bride to consume rolls and rolls of tissue the whole day from the preparations while her friends and family members come one by one into her room and even up to the end of the reception as she bids goodbye to her guests. But it’s even more touching and momentous to see the groom crying. Isn’t it? When a man of stature in his suit cries in front of a crowd as he delivers his vows for the bride, that’s just something. It’s truly a moment worth capturing. 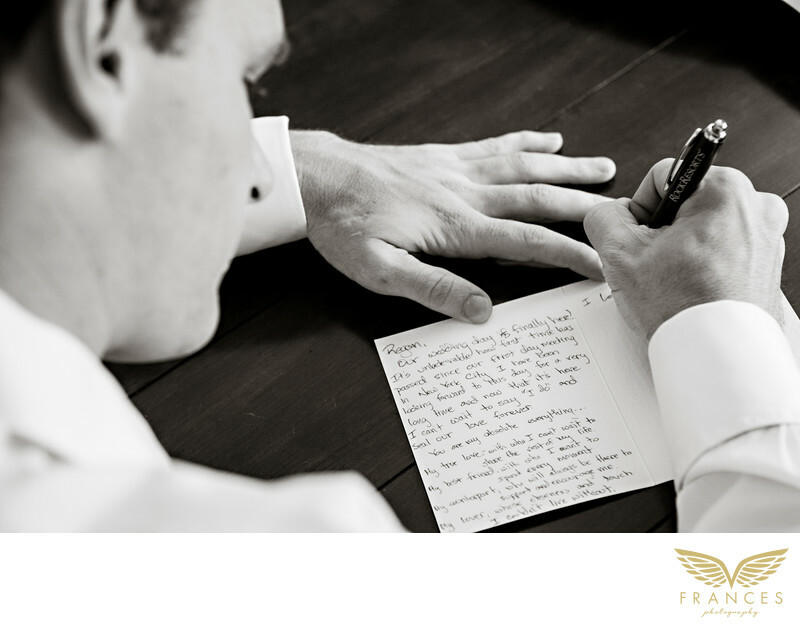 The groom in this black and white wedding photo writes that vow that will make him melt down in tears in front of his bride and the crowd. Guys may not be emotional all the time but their purest of emotions are revealed when they cry for the right reasons, such as when a groom confesses his love for the woman he will marry by reciting his genuine wedding vow. The story of the day ... Not only was this one of my favorite weddings of all time (and my biggest of the year), but this couple truly stole my heart. How much do I adore Regan and Jack? Let me count the ways...First, they met on a blind date. Thanks to the proximity of their families being friends and the intuition of Jack's younger sister Morgan, it all began over brunch in New York City. And even though they were living on opposite sides of the country at the time (Regan in NY and Jack in SD), well, love knows no distance. Their wedding was a black tie Colorado mountain fairy tale. Fulfilling their dream to get married on a mountaintop, they exchanged their vows amid the breathtaking views of the Beaver Creek Wedding Deck while tugging at everyone's hearts. Accompanied by her dapper groom, Regan was an absolutely stunning bride. The color palette of corals, creams and green was playful and perfectly transitioned into a lovely reception at Beano's Cabin. The abundance of natural birch, candlelight, roses and hydrangea made for stunning tablescapes and a warm atmosphere. Love and laughter filled the room from the bottom up. Location: 10 Elk Track Rd Beaver Creek, Colorado.